Give your Fujifilm X-T10 or X-T20 camera and 16-50mm or 18-55mm lens a touch of elegance while protecting it from dirt, scratches, and bumps with the black Ever Ready PU Leather Case and Strap from MegaGear. This two-piece case consists of a top and bottom, as well as a matching shoulder strap. The bottom half may be used independently as a half case and attaches to the built-in tripod mounting screw. This screw is threaded on the bottom for convenient tripod usage without having to remove the case. The top piece completes the all-round protection and attaches with snaps. This case version features a bottom opening for easy access to the battery compartment. 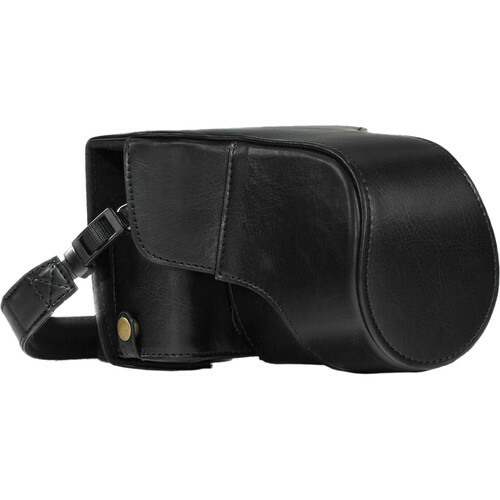 For style, this case has attractive stitching reminiscent of old world craftsmanship. The leather-like, sustainable polyurethane material reflects new world ecological sensibilities. Made of the same polyurethane but with a suede-like finish, the interior softly caresses your camera while also protecting it from scratches. Box Dimensions (LxWxH) 6.0 x 5.2 x 3.2"
Ever Ready PU Leather Case & Strap for Fujifilm X-T10/T20 with 16-50/18-55mm (Black) is rated 5.0 out of 5 by 1. Rated 5 out of 5 by Diego from Great Camera Case !!! Love it ! Is there a photo and colour choice for this product? Under the Product Highlights on the product webpage is a drop-down menu that allows you to select the model you are interested in purchasing. It also would display an image of the items on the left-hand side of the Product Highlights section after you make your selection. Can B&amp;H ships to Saudi Arabia ? Currently we are able to ship this item to Saudi Arabia.